Caring for orchids is easy when you take to time to select the best species for your comfort level and environment. With the right knowledge, many orchids are easy to grow and care for. You’ll be pleasantly surprised at how simple it is to ensure your orchids grow and prosper. Orchids are an elegant flowering houseplant with a finicky reputation. Before you let their difficult reputation deter you from purchasing one of these exotic houseplants, review the basic orchid care tips outlined below. Please note - the basic tips on caring for orchids featured below are a generalization – for orchid care tips related to a particular species, check out the links at the bottom of this page. Caring for Orchids – What Are the Basics? Bright, indirect light is ideal for most orchid species. Two orchids that require less light are moth orchids and lady’s slippers. These two orchids can be grown under fluorescent lighting. Choose the best orchid plant for your situation by selecting orchids that will thrive in the indoor and outdoor lighting and temperature conditions that you can easily provide. If you will be displaying orchids outdoors, choose locations that are protected from wind and receive filtered shade – away from direct sunlight. Temperature requirements will vary, depending on the species of orchid; however, there is one thing all orchids have in common – their need for a temperature variance of 15 - 20°F / 8 - 10°C between day and night. Orchid potting soil is made up of a mixture of coarsely chopped fir bard or redwood bard, with small amounts of peat moss, perlite, or vermiculite added in. This medium (or some variation) drains quickly and has enough room between the particles for air to circulate around the orchid’s roots. Since orchid mix decomposes slowly, it is important to re-pot (using fresh orchid potting soil) every two years. Even though orchids are slow growing plants, they should be fed regularly. High-nitrogen houseplant fertilizer at ¼ the normal strength is the recommended dosage. Feed orchids roughly once a week. When flowers start developing, you might consider switching to a high phosphorous fertilizer for a few weeks. If orchids are moved outdoors during the summer, you can increase the ratio of the fertilizer to ½ the normal strength due to nutrients being washed away by the need to water more frequently. Some orchids shed their leaves and have a period of rest during the winter. If this is the case, not feed you plant during this time – resting orchids do not need to be fed. Watering requirements will vary, depending on the species. Orchids that naturally grow in trees or on rocks should dry out between watering. Ground dwellers need a more steady supply of water. Some orchids have pseudobulbs (swollen stems), which function as water-holding organs. Pseudobulbs gather and store moisture until it is needed. Orchids are easily damaged by too much water; pay very close attention to your orchids watering requirements. 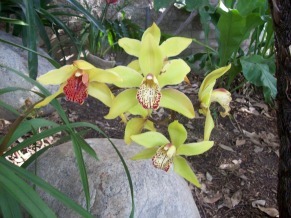 Orchids are sensitive to the salts that can accumulate in the potting medium. Flush your orchids monthly by giving your plant a thorough watering. After excess water drains away, repeat process. Many orchids require a minimum of 50% humidity. Mist plants lightly with distilled water. Tap water can leave salt deposits on the leaves. Another way to supply humidity is to place orchid pots on a tray filled with damp stones or pebbles. If you have several plants that require humidity, you can place a bowl of water or a humidifier near the plants. Although orchids thrive when slightly root-bound, most orchids should be repotted every two years. The main reason is to provide fresh potting medium, since orchid potting mix decomposes gradually over time. The best time to re-pot an orchid is during the active growing period (usually during summer). When caring for orchids, the time to propagate an orchid plant will depend on the species and growth habit. Do not assume your orchid will need to be divided every time you re-pot the plant. For repotting instructions, refer to the specific orchid species. If you pay close attention when caring for orchids, the plants will let you know when they are ready to be propagated. How it should be done will depend on the species. Dendrobiums produce aerial roots that can be cut off the top of the plant, with roots still attached, and potted up. 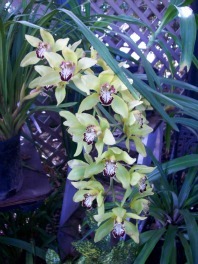 Cattleyas, oncidiums, and other orchids that produce pseudobulbs can be cut into clusters of three and repotted. Lady’s slippers form clumps, and should be divided every four to six years. Dendrobiums and moth orchids develop small plantlets (keikis) on the flower stem close to the parent plant. When the plantlets have three leaves, and a root that is 3 in / 7.5 cm long, cut them off and plant them in a new pot. For detailed propagation instructions, refer to the specific orchid species. Look for plump roots and no bruises or soft spots on the crowns. Buy mature plants that are on the verge of producing a flower spike. Orchids that are in full bloom, or are on the verge of blooming are usually priced higher than those that are not ready to flower.